On Sunday me and Jack took a trip to the beach just down the road from us. We both grew up in this area and love coming to the beach as we find it so relaxing and peaceful. We can't imagine not living by the sea now, hence the hope of moving to Brighton in the future instead of London. Due to the recent weather we haven't been to the Royal Victoria Country Park in a long time but seeing as it was a lovely hot day (and the fact Jack now has Sunday's off work) we decided to head on down! The outfit was very comfy and chilled out for me. I don't usually wear anything so basic but it was the perfect Sunday attire, and of course I just couldn't help but wear these shoes...again! Of course going to the beach when the tide is out wouldn't be complete without a bit of guppy and crab hunting! Unfortunately I wasn't quite prepared with my choice of footwear so Jack was on the hunt this time around. Guppy and crab hunting is something we always used to do years ago so it was nice to reminisce and do it again. Obviously we don't keep them or do anything with them, we just find them, occasionally pick them up, and then leave them to it. It's just fun to do, like when you were a kid! Hey sweets! Today's blog post is in connection with this week's YouTube video, which you can watch below. I thought I would do this is a blog post as well to write a little bit more information on what I mean. 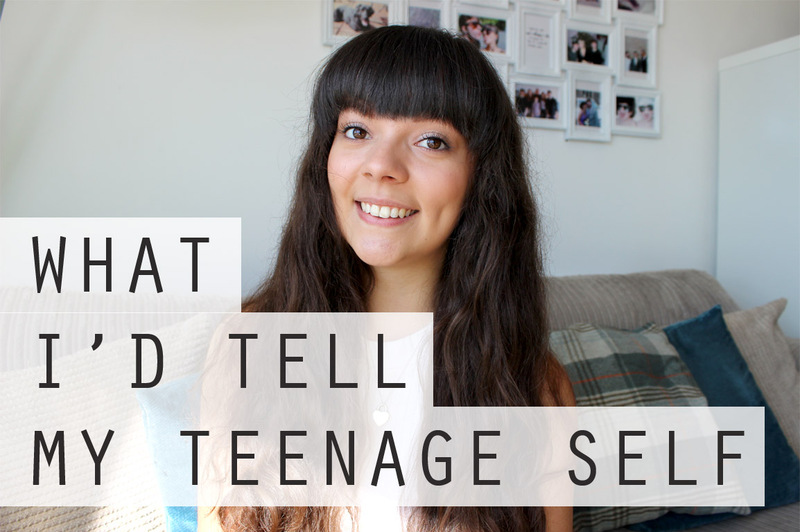 So today's post is all about what I would tell my teenage self knowing what I know now...if that makes any sense?! I picked out 5 points and explained them briefly in my video but below I have talked about them in a little more detail. 1. Stop worrying about if someone doesn't like you. In school I was always worried about what people thought of me, whether people liked me, if people liked what I was wearing etc. Now this wasn't me fishing for friends or anything like that I just used to want to fit in, as we all do in school. I had a large group of friends so really I had nothing to worry about but I think this is something that all teenagers go through in school. We're all worried about 'fitting in' when really who even layed down the lies of what 'fitting in' means anyway?! Since leaving school, infact, since leaving full-time education I've come to realize that I don't really care what people think of me or if they like what I'm wearing, if I like it I'm going to wear it! It really doesn't matter what people think either, so long as you're a nice, kind person then those you mind what you are doing don't matter and those who matter will never mind, they'll love you for you! I didn't do great in my GCSE's due to a lot of my 'friends' in school ditching me and a couple of my other friends. There was no reason for it, it was just what they decided to do at the time. We still don't talk now! But the fact is I spent way too long crying over it instead of revising. If I could see my teenage self now I would shake her and say 'Forget about them, concentrate on you!'. 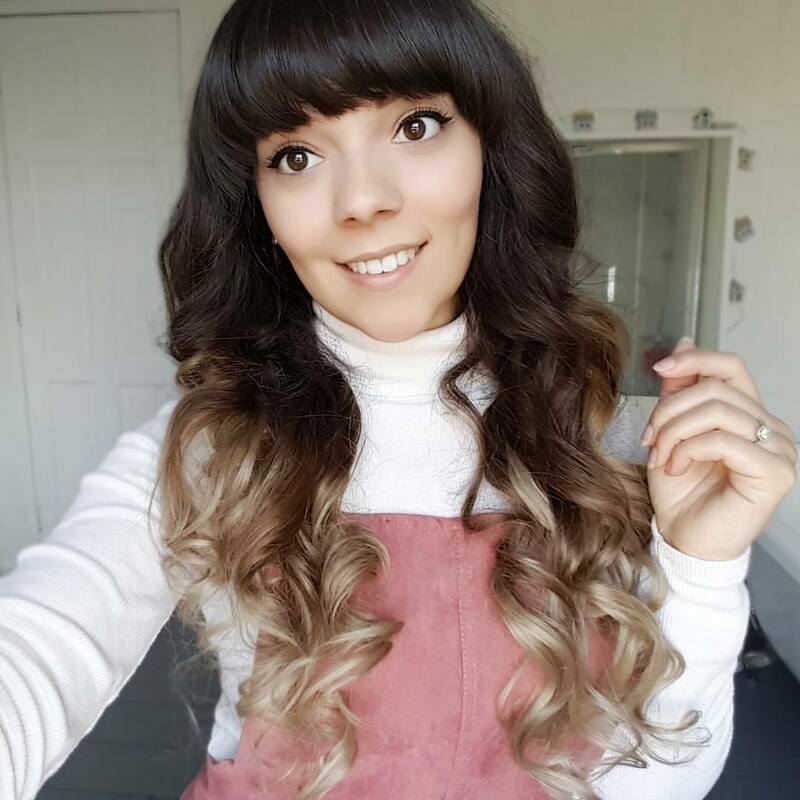 My GCSE grades did not effect my future at all, I still did well enough to get a Triple Distinction in my BTEC course, a Merit in my Pre-Degree course and get a degree in Fashion at university, so it didn't stop me at all, but I just wish I gave myself the best chance of getting good grades. 3. Stop telling yourself you can't do something. I annoy myself because as a teenager I had good intentions to do something and then as soon as I came across a hurdle I would give up and tell myself I couldn't do it. And this could be anything from sports to learning Spanish, I was useless at being determined to do something. I know teachers and parents always say 'you can do anything you put your mind to' but you never listen as a teenager so I wish I could tell myself that and make myself believe it! 4. When 'friends' ditch you, shrug it off. Now this one I have briefly touched on already in number 2 so I won't repeat myself, but to add to it I would tell myself that everything happens for a reason, it may seem horrible right now but this isn't the 'be all and end all' it will get better, you'll find new friends in college and you'll realize that you are so much better off! 5. Be sensible with money. Lastly, I would tell myself to be sensible with money whilst still living at home. Always think about what you are buying, does it have longevity? Will you still like it in 3 months time? Because now that I am renting and paying bills it is a lot harder to save money, let me tell you! If only I'd saved more when I was in college (because university was expensive in itself!) then I would be a lot better off now! I have no debts, apart from my uni tuition fees, but I would just feel more comfortable now if I had saved all those years ago when I got my first job! It would seem these jeans and shoes have made another appearance on the blog...sorry about that, they're just so wearable! Tonight's outfit is what I wore to mine and Jack's Date Night last night. It was a last minute decision to eat out so we decided to not over-dress and go more 'smart casual' (whatever that is?). I had already worn this shirt throughout the day at work so I just changed my jeans, added my trusty fedora (perfect for when your hair isn't looking so fresh!) and these Primark slingbacks, which I am still lusting over if you couldn't already tell! I did wear my Topshop leather jacket too as it turned out to be quite a chilly evening. The setting for this quick shoot was just on our small balcony. I love the views from our balcony, despite it being mainly houses, but we do have a little sea view in the distance. Most of the time the area we live in is lovely a peaceful, apart from sunny days when the kids from the neighborhood are playing outside, but I quite like that as I think kids should be outside rather than stuck inside glued to their TV screens! 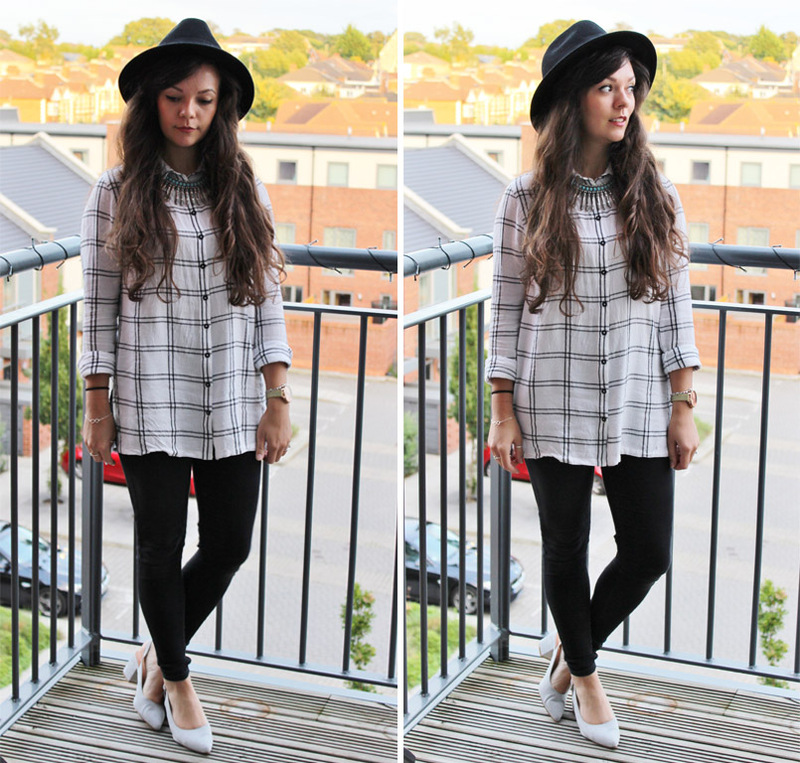 I love this check shirt from New Look as it is lose fitting and can be worn all sorts of ways with all sorts of pieces. I paired it with this statement necklace which I also bought from New Look a few years ago. Eventhough I've had it for a couple of years now I still love wearing it, there's just something about the turquoise against the old-looking silver. And of course one of my cats, Bow, just had to get involved (mummy's girl!). This weekend I got a little creative with a jam jar that I've been storing in the cupboard for goodness knows how long until I found a use for it! Well, that day came and I decided to turn it into a pen pot. I have been trying to organize myself recently and decided to revamp my desk by putting my laptop on it and actually using it! You can see how I have been getting organised recently and how my desk area looks in full in this blog post, but for now here's how I jazzed up a simple jam jar, no step-by-step needed, it's pretty straight forward! I hope you enjoyed this little DIY post, it's super easy and just adds a little something to a boring desk area! Hey all, another outfit using Jack's amazing photography skills! He's so good at it, I think he secretly loves taking them really ;) So this week I have been loving this gingham blouse from Zara which I actually got in the sale last month. For this outfit I just paired it with my trusted Joni jeans from Topshop and my black lace-up shoes from Tesco (who knew supermarket's could do such great shoes?!). I also opted for this vintage velvet blazer which was actually given to me by Jack's Mum. I wasn't sure about it at first but once I rolled up the sleeves I really liked it and found I could pair it with most items in my wardrobe. I also did a YouTube video based on this gingham blouse (that's how much I love it), so check it out here. Visit Kirsti's profile on Pinterest. 008. A trip to Marwell Zoo! © Silent Sweetheart | All rights reserved.